Logan • Before this game started, Utah State basketball coach Tim Duryea’s mind immediately went to the ending. That’s exactly what the Aggies did against Boise State, just this once. USU’s 71-65 upset Saturday night gave Duryea his first win over the Broncos in his three seasons on the job. Counting a defeat in former coach Stew Morrill’s last season, the Aggies took a six-game losing streak against Boise State into the game. Thoughts of USU’s fade last month in Boise, among other tough defeats recently in the series, naturally struck some percentage of the 8,421 fans in the Spectrum as the clock wound down. That’s how they performed, backing up their self-belief. On five occasions in the last two-plus minutes, USU’s lead was down to two or three points. And every time, the Aggies responded. Sam Merrill and McEwen hit 3-pointers, Diogo Brito and McEwen delivered dunks via press-breaking passes from Quinn Taylor and Merrill and then Dwayne Brown Jr. made a clinching free throw with 10.8 seconds remaining. 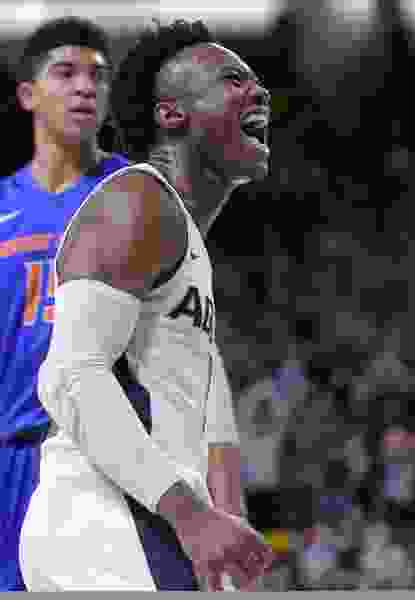 Other than a McEwen turnover, the Aggies showed poise when they needed it and exploited Boise State’s pressing defense in the final minute, enabling them to complete what has to rank as the most meaningful victory of Duryea’s tenure. Against the press, “We always just want to be really aggressive,” Duryea said. McEwen scored 23 points for USU, now 14-12 overall and 7-6 in the MW. Brito added a career-high 16 points and Merrill scored 10 of his 12 in the second half. The Aggies also got significant help from Brown and Taylor, after they missed Wednesday’s loss at Wyoming. Brown emerged inside in the second half, after USU made only four 2-point baskets in the fist half and trailed 34-27. Taylor, a rugged forward, entered the game with 28 assists this season. He added two more Saturday, and they came at critical times. Taylor’s pass out of the lane led to McEwen’s 3-pointer for a 64-58 lead with 1:08 left. And then, after almost being trapped along the sideline, Taylor found Brito for a dunk. Chandler Hutchison, the conference’s preseason player of the year, led Boise State (20-5, 10-3) with 28 points. Even so, Merrill and other USU defenders kept him from taking over the game. The Broncos have a knack for winning close games this year, and they had beaten Duryea’s teams by a total of 12 points in the last four meetings over three seasons. That list included the mid-January game in Boise, where the Aggies led by nine points midway through the second half before crumbling in a 71-67 loss. In the end, that’s just what the Aggies did. • Utah State holds on for a 71-65 win over Boise State in Logan, breaking a six-game losing streak in the series. • The Broncos’ loss drops them out of first place in the Mountain West, a half-game behind Nevada. • USU is tied for sixth place in the 11-team conference with New Mexico, going into games at UNM and at home vs. Nevada.